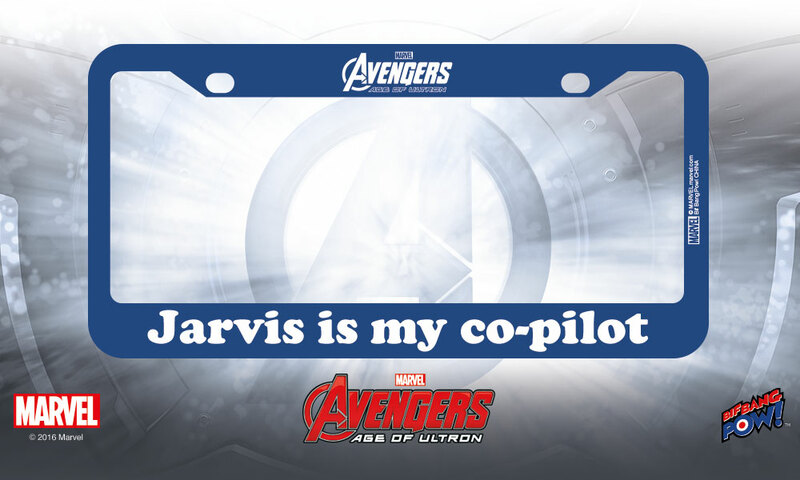 Take J.A.R.V.I.S on the road with the new "Jarvis is my co-pilot" license plate frame from Bif Bang Pow! – now available for pre-order at Entertainment Earth. 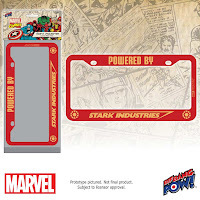 Inspired by Marvel's Avengers: The Age of Utron, this standard-size license plate frames measures 12 1/4-inches wide and 6 1/4-inches tall and can be quickly and easily added to your car or truck. With the phrase "Jarvis is my co-pilot" in white text along the bottom and Marvel's Avengers: Age of Ultron top and center, the Jarvis Is My Co-Pilot License Plate Frame pays homage to a similarly styled bumper sticker spotted in the Avengers' quinjet during the film. Want to see more? 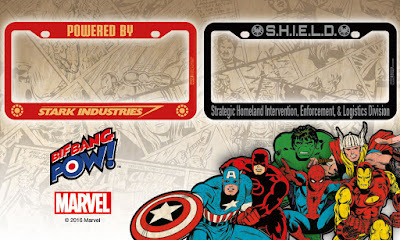 Check out all our car accessories from Bif Bang Pow! – only at Entertainment Earth. Proudly display your love for the Marvel's Avengers wherever you go with the new two license plate frames from Bif Bang Pow! 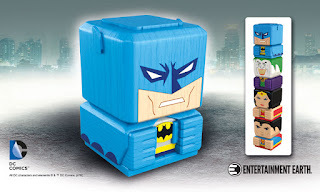 – now available for pre-order at Entertainment Earth. 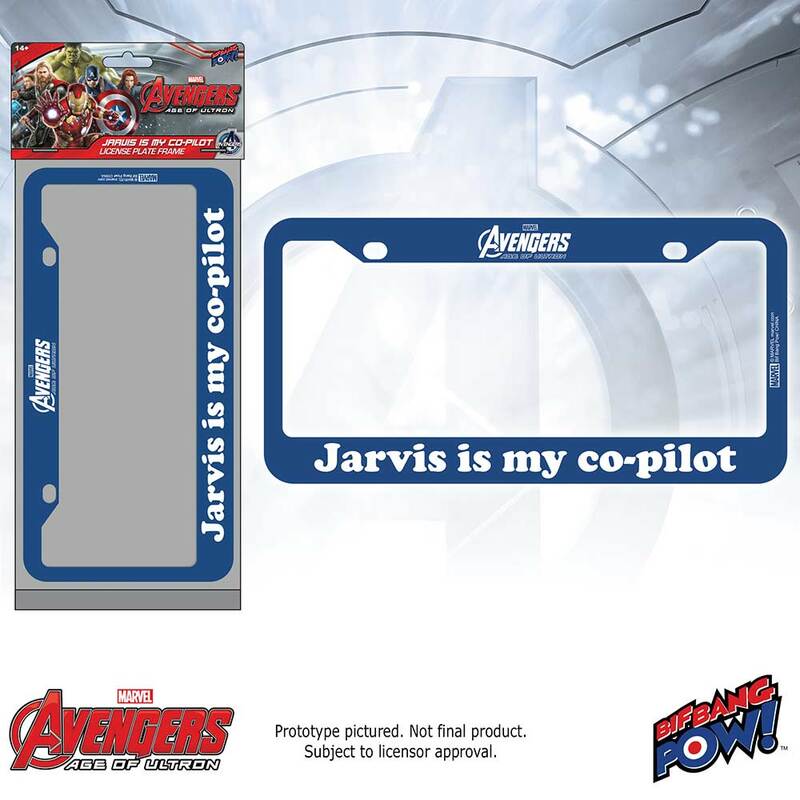 Each measuring 12 1/4-inches wide and 6 1/4-inches tall, these standard-size license plate frames can be quickly and easily added to your car or truck. 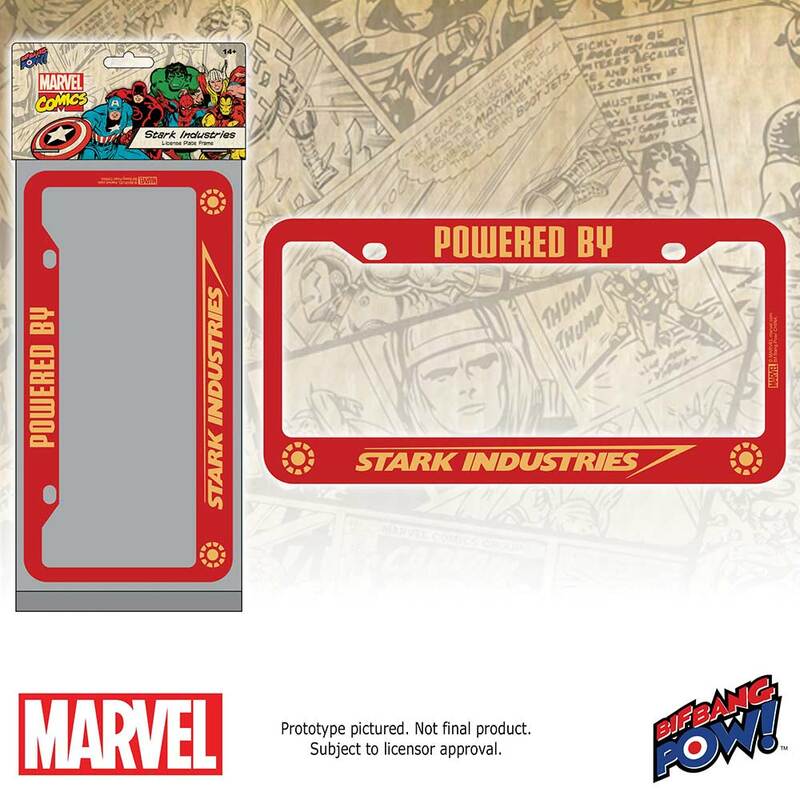 The red Stark Industries License Plate Frame features the phrase "Powered by Stark Industries" in yellow text along the top and bottom with the arc reactor symbols on the bottom left and right corners. The black S.H.I.E.L.D. License Plate Frame features the origination’s iconic emblem on each side of the well-known acronym “S.H.I.E.L.D." across the top. The name "Strategic Homeland Intervention, Enforcement, & Logistics Division" is spelled out in gray text along the bottom of the frame. 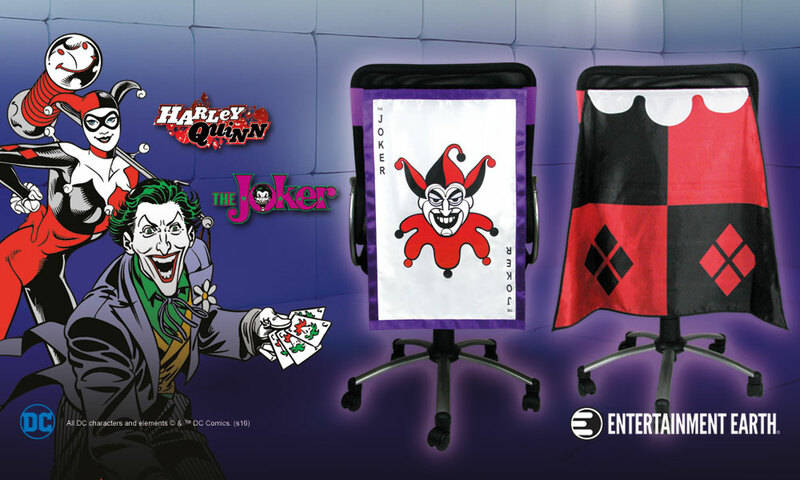 Your chair will never be the same once THE JOKER™ and HARLEY QUINN™ get a hold of it! 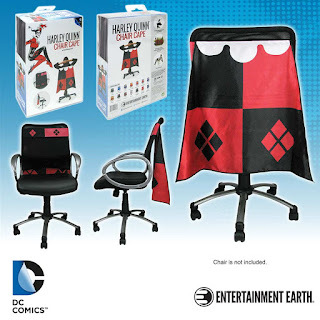 The devious GOTHAM CITY™ duo is making their way to homes everywhere as two new Chair Capes™ – now available for pre-order at Entertainment Earth. Inspired by the classic HARLEY QUINN™ comic character, the Harley Quinn Classic Chair Cape features jester-inspired artwork prominently displayed on the red and black cape with the same artwork shown on the adjustable red and black chair strap. 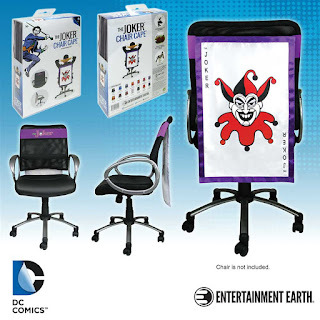 Meanwhile The Joker Classic Chair Cape will transform your tame chair into a seat fit for a mischievous jokester with the infamous Joker card prominently displayed on the purple cape with the classic THE JOKER™ emblem shown on the adjustable purple chair strap. Made of high-quality fabric materials, the patent-pending Chair Cape™ line from Entertainment Earth adjusts to fit most size chairs by using an adjustable hook and loop belt and strap design to wrap securely around the back of your chair. 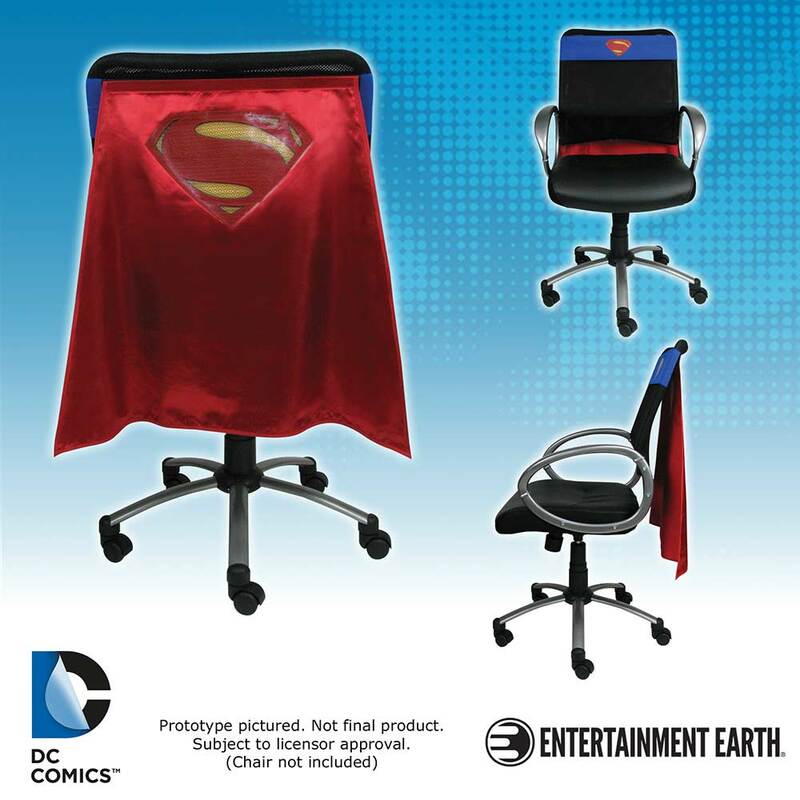 Each Chair Cape™ measures 30-inches wide and 24-inches long. 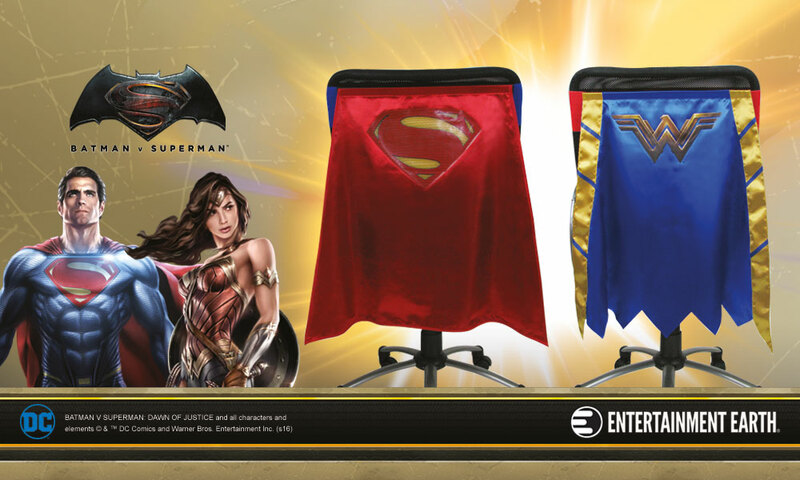 Dress your chair to impress with two new Batman v Superman: Dawn of Justice Chair Capes™ from Entertainment Earth: SUPERMAN™ and WONDER WOMAN™ – now available for pre-order at Entertainment Earth. This Batman v Superman: Dawn of Justice Superman Chair Cape will transform your tame chair into a seat fit for a Super Hero! The movie-inspired SUPERMAN™ S-Shield 5 is prominently displayed on the red cape with the same emblem shown on the adjustable blue chair strap. 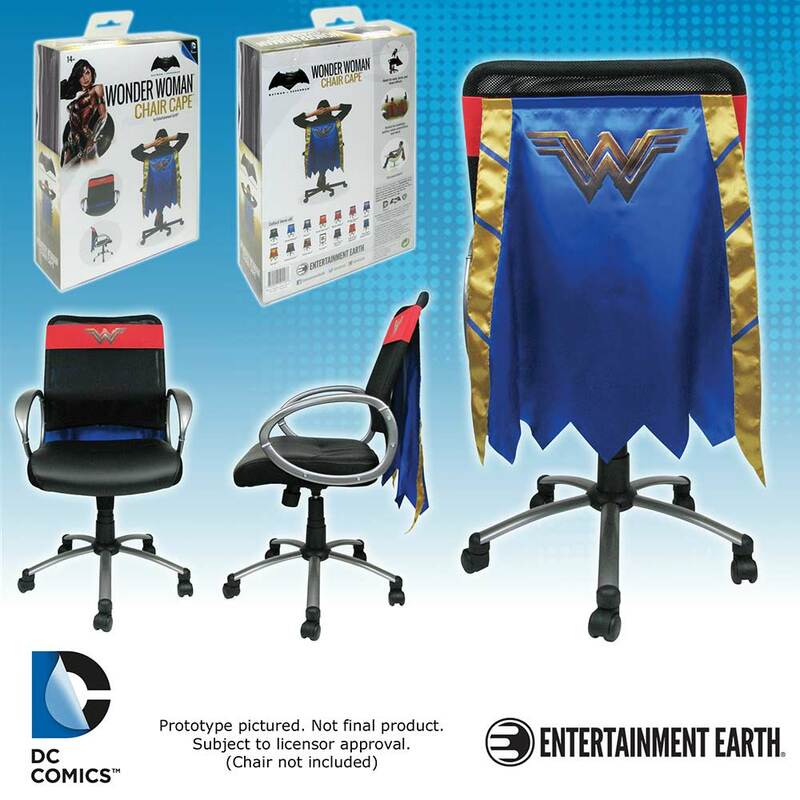 From the office to a Super Hero-themed party, this Batman v Superman: Dawn of Justice Wonder Woman Chair Cape celebrates the movie’s costume design with the iconic WONDER WOMAN™ logo prominently displayed on the blue and gold cape with the same emblem shown on the adjustable red chair strap. 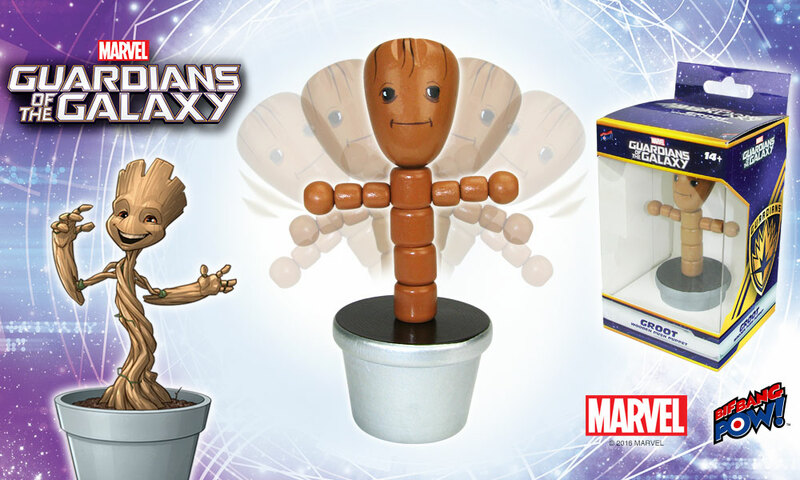 After selling out during a hugely successful debut at 2016 San Diego Comic-Con, the Groot 4-Inch Wooden Push Puppet from Bif Bang Pow! 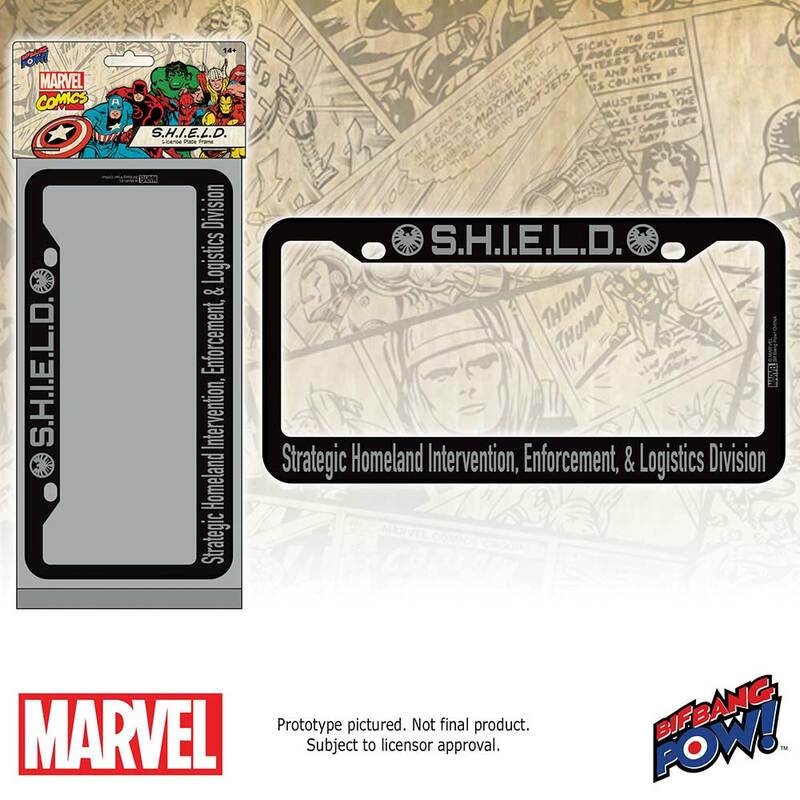 is back with a silver variant base - available now for pre-order. 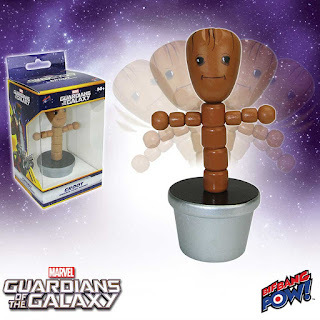 Measuring 4-inches tall, this potted Groot wooden push puppet features hand-painting along with some decal elements. Designed similarly to vintage-styled push puppets, you can move the push puppet in various directions depending on how you push the hidden button on the bottom of the pot - providing hours of wobbly fun. 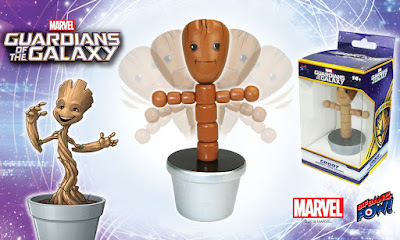 And well, because it's only right… this charming collectible celebrating the extraterrestrial, sentient tree-like creature is crafted out of solid wood, of course! Ages 14 and up. Don't wait: pre-order yours today! Made for Lovin’ You! 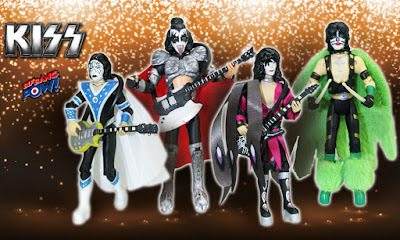 New KISS Dynasty-Era Action Figures! Bif Bang Pow! expands their ever-popular line of KISS 3 ¾-inch action figures with a brand-new series! Available for pre-order at Entertainment Earth, each of the iconic group’s bandmates are rocking outrageously awesome outfits based on what they wore during their 1979 Dynasty tour. Prototyped by 3D systems (a.k.a. 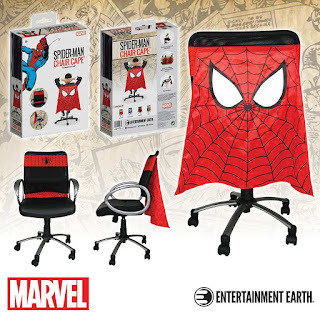 Gentle Giant), each detailed figure features 11 points of articulation (neck, shoulders, biceps, elbows, hips, and knees), corresponding instrument accessories, and removable cloth capes … because rocking out can be hard to do with a cape getting in the way of your moves! 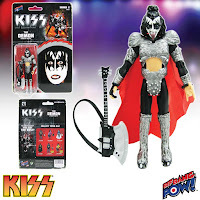 The KISS Dynasty The Demon 3 3/4-Inch Action Figure rocks the night away with his classic facial expression, axe bass accessory, and removable red cloth cape. 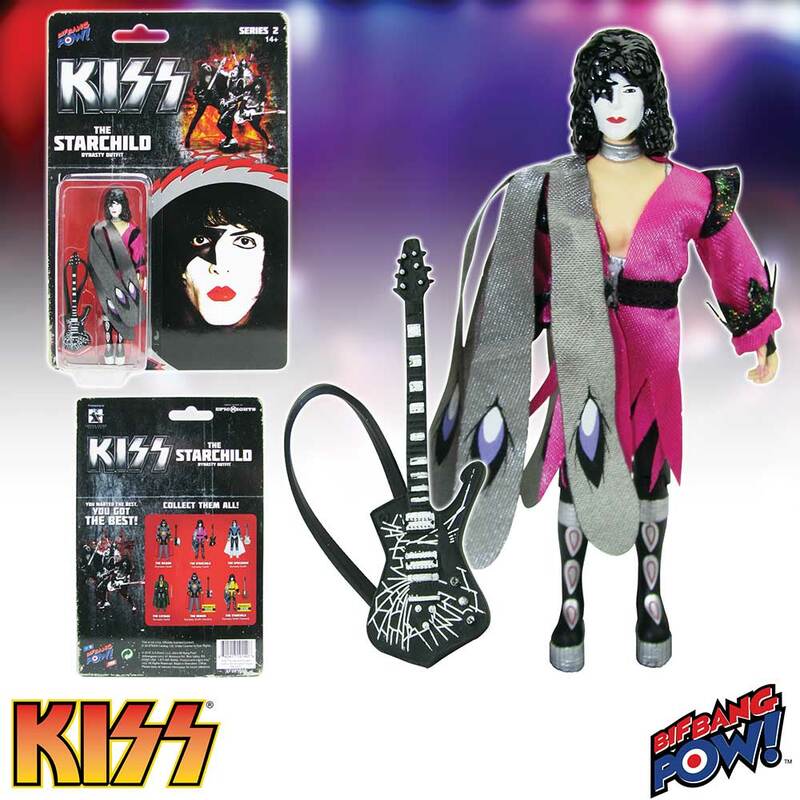 The KISS Dynasty The Starchild 3 3/4-Inch Action Figure comes to life right before your eyes with his cracked mirror guitar accessory, and highly detailed and decorative, removable fuchsia cape with silver and purple peacock-inspired accents. The KISS Dynasty The Spaceman 3 3/4-Inch Action Figure orbits in the stratosphere of rock with his classic silver and yellow guitar accessory and removable white cloth cape. 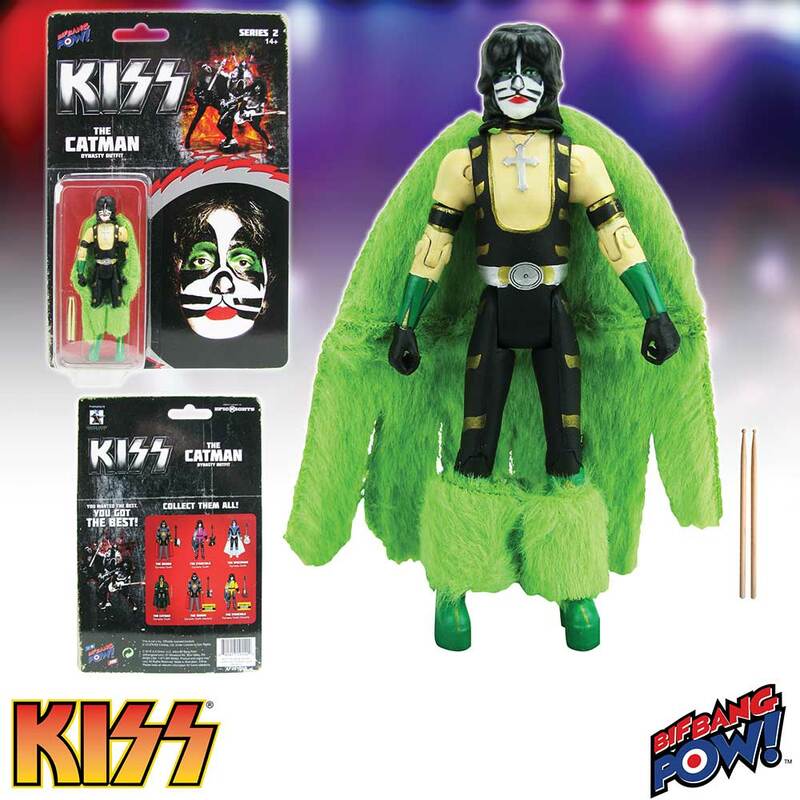 The KISS Dynasty The Catman 3 3/4-Inch Action Figure dominates the drums with his drum sticks and removable lush green fur cape and ankle cuffs. So what are you waiting for? Pre-order today and rock the night away! Want more? Check out the complete KISS line from Bif Bang Pow! today. 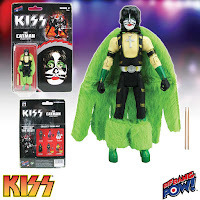 © 2016 KISS Catalog, Ltd. Under License to Epic Rights. Remember when Sulu showed off his fencing skills in the classic Star Trek: The Original Series episode "The Naked Time"? Well, so do we! And now, Bif Bang Pow! captures that memorable episode with the first-ever Star Trek: The Original Series The Naked Time Sulu Deluxe Bobble Head – now in stock at Entertainment Earth. 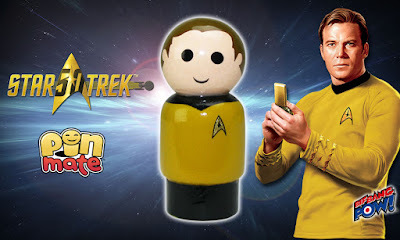 In continued celebration of the Star Trek 50th anniversary, this unique all-resin bobble is a must have for any classic Trekkie collector. 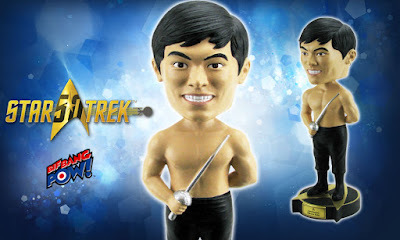 Measuring 7-inches tall, the Star Trek: The Original Series The Naked Time Sulu Bobble Head features the muscular lieutenant with his infamous sword as he stands on a delta-themed based. Be among the first to secure this fun, commemorative bobble head for your collection and order yours today! 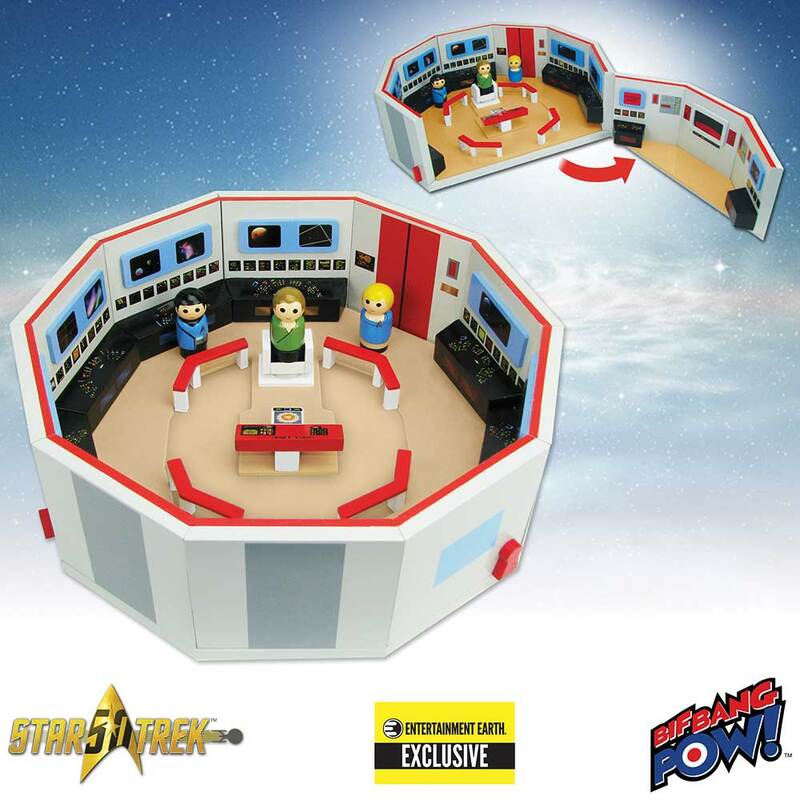 From bobble heads to Pin Mate™ figures and more, be sure to check out the complete line of Star Trek collectibles from Bif Bang Pow! 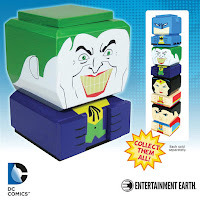 at Entertainment Earth. Conquer the Elements with the Light-Up KISS Umbrella – Back by Popular Demand! The KISS Retro Umbrella with Light-Up Tube and Flashlight Handle will put some rock n’ roll in your step when it’s raining outside. Back by popular demand and available now at Entertainment Earth. Neither pouring rain nor torrid sun can keep you indoors when you have your KISS Retro Umbrella from Bif Bang Pow! in hand. The black canopy of the KISS umbrella features artwork of The Demon, Starchild, Spaceman, and Catman from their 1978 solo albums along with the KISS logo in white. It measures 39 1/2-inches from the very top down to the black base of the handle. The handle also includes a push button flashlight. When open, the umbrella measures 40-inches across. Best of all, the rod lights up in a variety of ways to suit your style. Click the button on the handle for a solid red, purple, green, blue, or white light or for a rotating blend of all the colors! Requires 3 "AAA" batteries, not included. Order yours today and conquer the elements in KISS style! 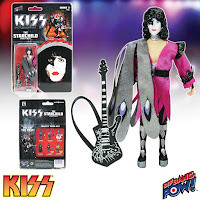 See more KISS collectibles from Bif Bang Pow! here! 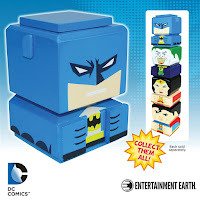 Something new is coming to Entertainment Earth! Complement your collection and celebrate some of the most iconic characters from DC with a brand-new line of collectible wooden Tiki Tiki Totem™ pieces - now available for pre-order at entertainmentearth.com. The first four pieces of this never-before-seen line include BATMAN™, SUPERMAN™, WONDER WOMAN™, and THE JOKER™. Pre-order your Tiki Tiki Totem™ pieces now, and be among the first to collect these classic characters in their new form! Want more? 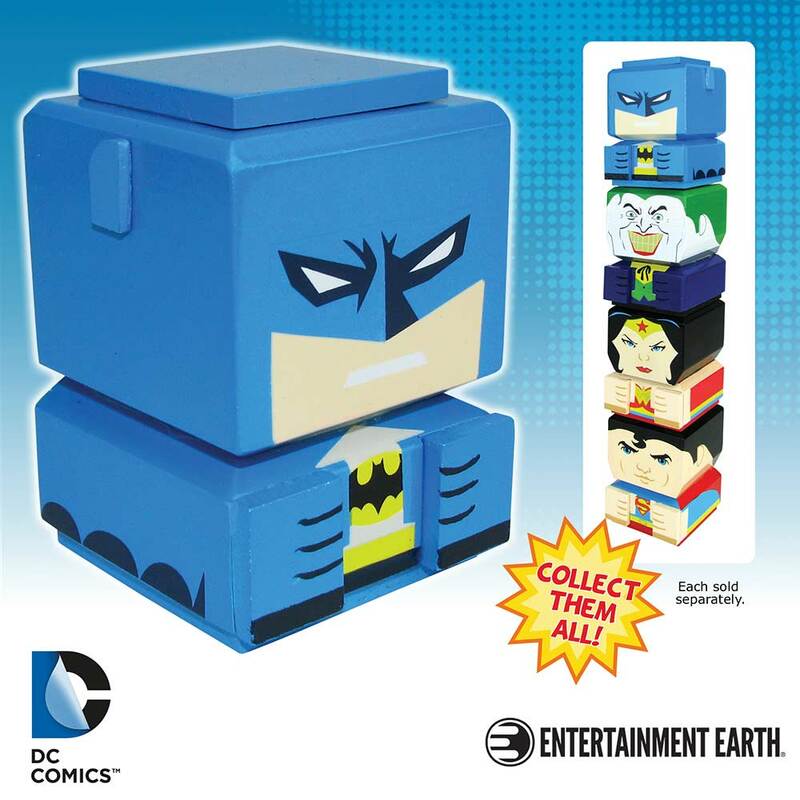 Shop DC merchandise by Entertainment Earth today. 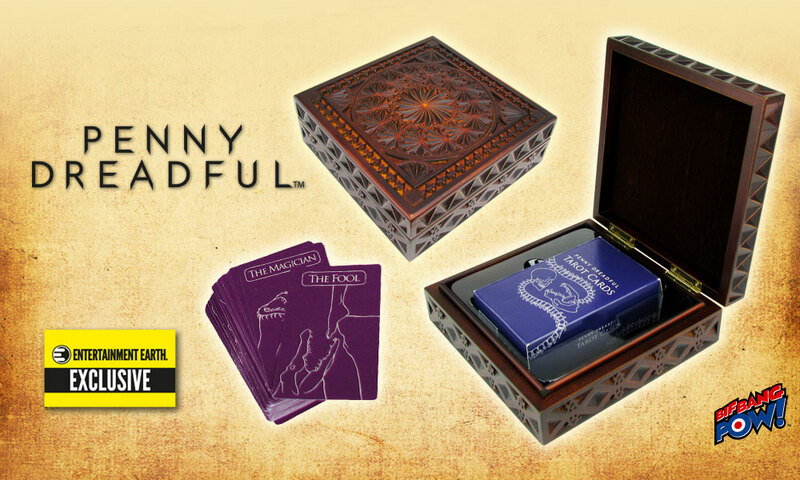 The captivating world of Penny Dreadful may have come to an end, but that doesn't mean your collection has to end too! The Penny Dreadful Tarot Card Deluxe Carved Wood Box Set is available now for pre-order as an Entertainment Earth Exclusive. 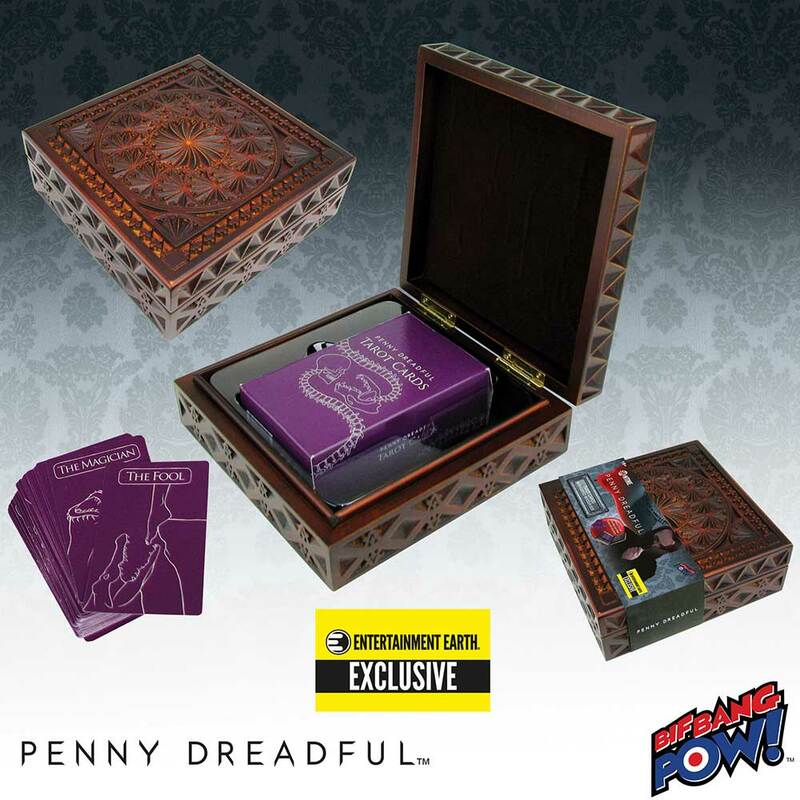 Just like the set used by the show's heroine (Vanessa Ives), this replica features an authentic wood-carved box lined with velvet that is embossed with pattern artwork (as seen when the cut-wife first introduces Vanessa to the tarot cards in her cottage). Inside, 78 premium Tarot cards are adorned with marvelous, series-true artwork along with an informative instruction book! 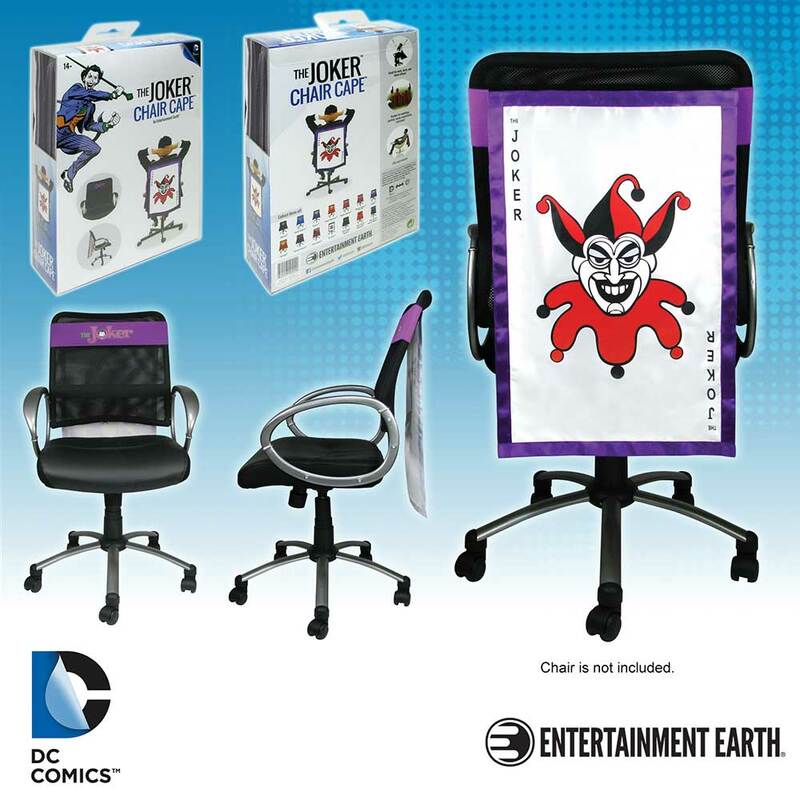 Made of smooth laminated paper, each Tarot card measures 4 3/4-inches tall x 2 3/4-inches wide. The accompanying 96-page instruction book contains card meanings, popular card layouts, and guidelines. It will introduce you to the Tarot and walk you through the information you need to conduct your own Tarot readings in no time! 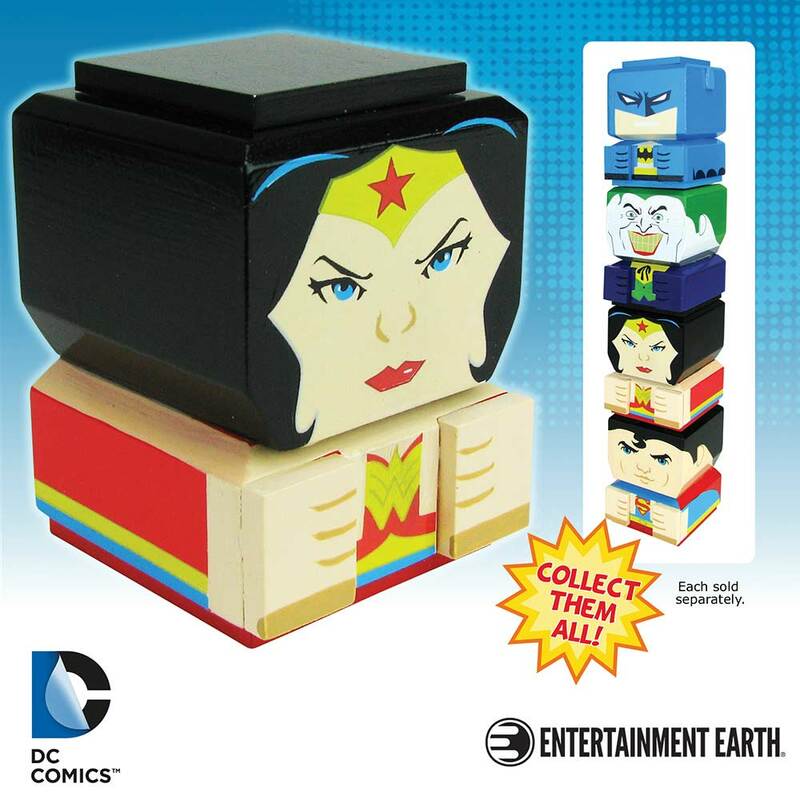 Limited to 1000 pieces, each limited edition Entertainment Earth Exclusive set is individually numbered with a holographic sticker. Ages 18 and up. Pre-order yours today and grab hold of your future! And don't forget, Bif Bang Pow! 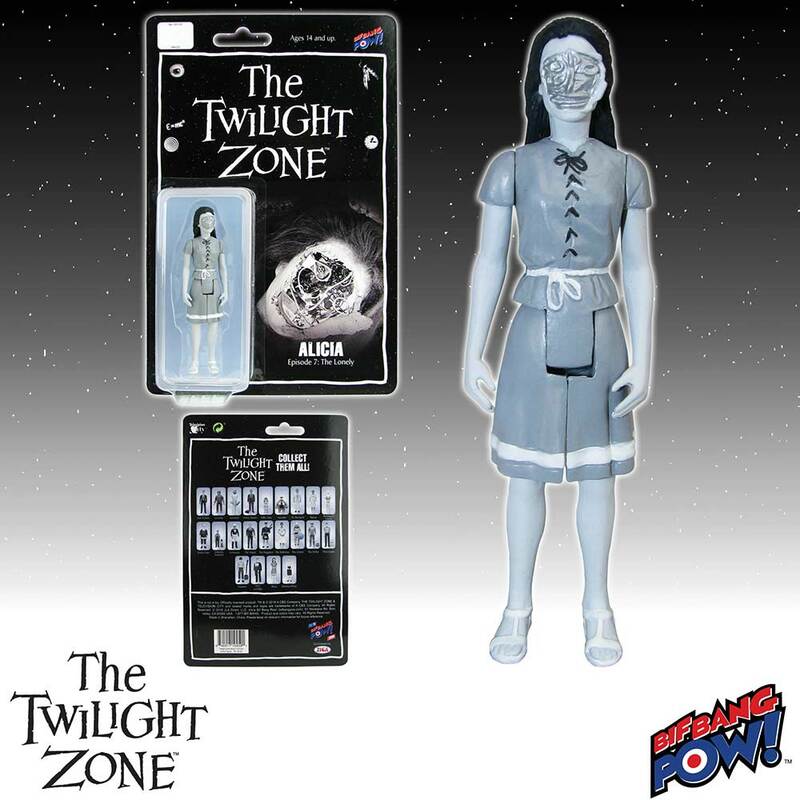 has a complete line of Penny Dreadful collectibles - all available at Entertainment Earth. "Penny Dreadful": TM & © 2016 SHOWTIME NETWORKS INC. All Rights Reserved. Boldly go where no miniature wooden figure has gone before with the Star Trek: The Original Series Captain Kirk Pin Mate™ from Bif Bang Pow!, now in stock at Entertainment Earth. 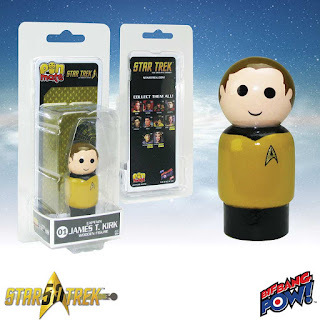 This 2-inch wooden Pin Mate™ figure celebrates the beloved captain from Star Trek: The Original Series. Designed with a retro-style, this Captain Kirk figure showcases the iconic captain uniform with 360-degree artwork that includes hand-painted elements with decal graphics. Uniquely numbered on the bottom of the figure and on the packaging, the Star Trek: The Original Series Captain James T. Kirk Pin Mate secures its place as No. 1 in the series. Kirk is a must-have companion piece to the rest of the Star Trek: The Original Series Pin Mate™ figures: First Officer Spock, Lieutenant Uhura, Chief Engineer Scotty, Dr. McCoy, Lieutenant Sulu and Ensign Chekov (each sold separately) – all available at Entertainment Earth. Order yours today! Remember when Sulu showed off his fencing skills in the classic Star Trek: The Original Series episode "The Naked Time"? Well, so do we! And now, Bif Bang Pow! 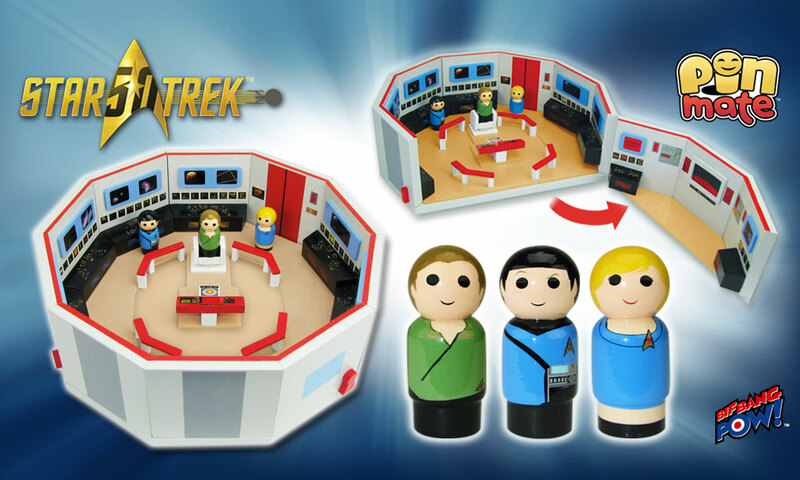 captures that memorable episode with the first-ever Star Trek: The Original Series The Naked Time Sulu Deluxe Bobble Head – now available for pre-order at Entertainment Earth. Be among the first to secure this fun, commemorative bobble head for your collection and pre-order today! From bobble heads to Pin Mate™ figures and more, be sure to check out the complete line of Star Trek collectibles from Bif Bang Pow! at Entertainment Earth.. It's time to "Shout It Out Loud" … Bif Bang Pow! 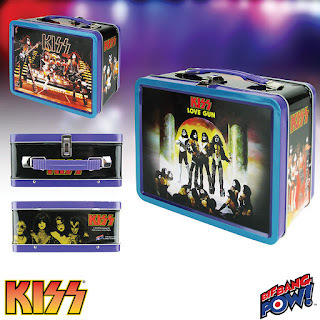 offers more ways to celebrate legendary band KISS, with not one but two new KISS tin totes - introducing the KISS Destroyer Tin Tote and KISS Love Gun Tin Tote, available and in-stock today at Entertainment Earth. 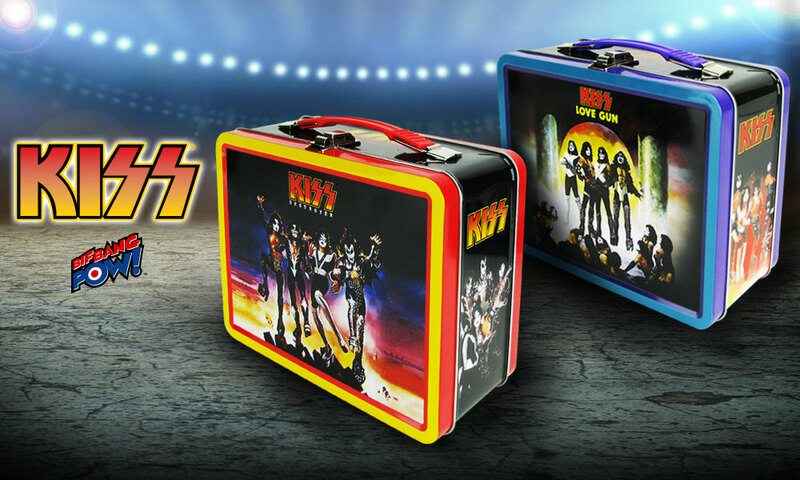 You may have seen KISS tin totes before, but you’ve never seen these all-new versions. The BBP team went through the KISS archives to find colorful, iconic and rarely printed photography of the band from the Destroyer and Love Gun eras. 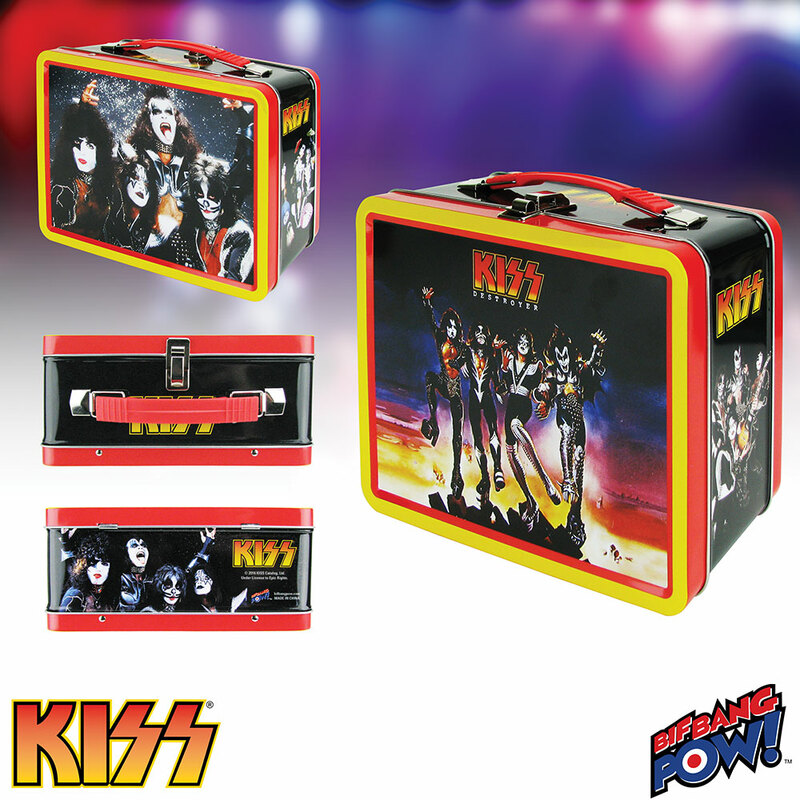 These tins totes have something unique to show on all sides – and that’s a first for KISS tin tote collectors. 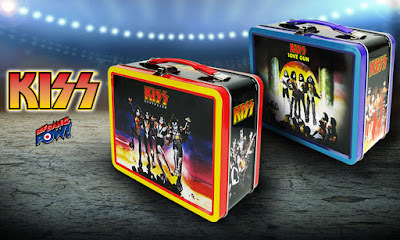 Presented together for the first time, the colorful red and yellow KISS Destroyer Tin Tote showcases five quintessential Destroyer-era images on one unique tin tote collectible. The iconic Destroyer album cover commands attention as it's featured on the front with four additional era-specific photos of the band during various promotional shoots on the sides, back, and bottom. In addition, this one-of-a-kind tin tote also sports a vibrant red carrying handle on top. Equally as impressive, the purple and blue trimmed KISS Love Gun Tin Tote combines five notable era-specific images on one rare tin tote. The popular Love Gun album cover is prominently featured on the front with a sick Love Gun-era stage shot on the back. Along the edges and bottom, KISS fans are treated to promotional photos taken by Barry Levine during the well-known "Love Gun sessions" in New York. 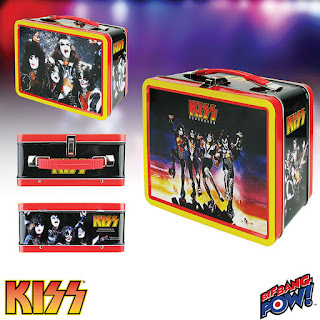 And to top it all off, this must-have tin tote features a purple carrying handle, so you can carry your KISS action figures and more in style. Each tin tote measures 8 5/8-inch wide x 7-inch tall x 4-inch deep and features an adult-sized handle along with a secure metal latch for closing. So what are you waiting for? "Pull the Trigger" and order today! Can't get enough KISS? 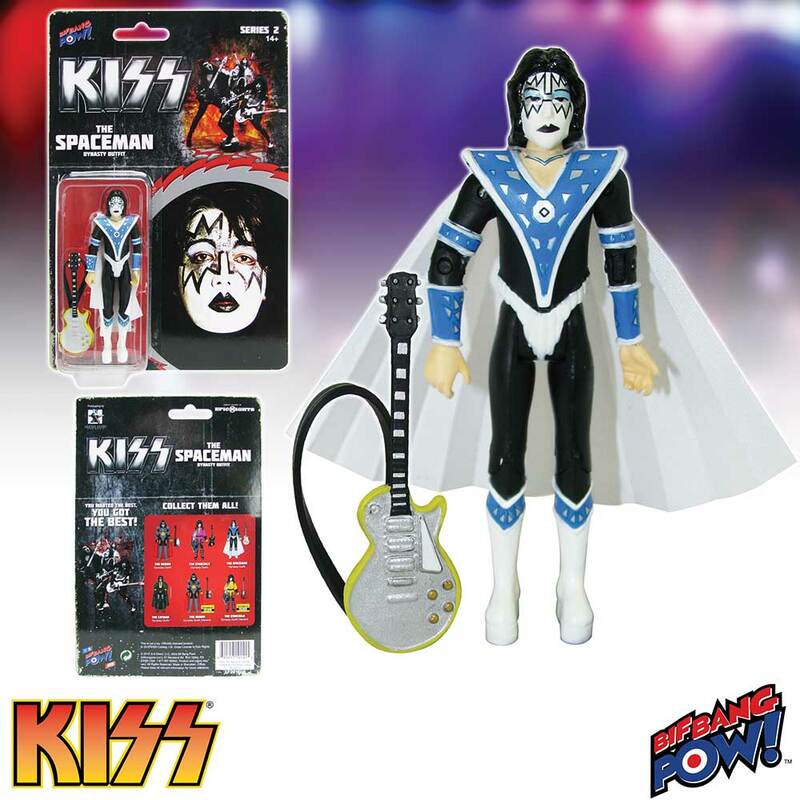 Shop all KISS collectibles from Bif Bang Pow! at Entertainment Earth. 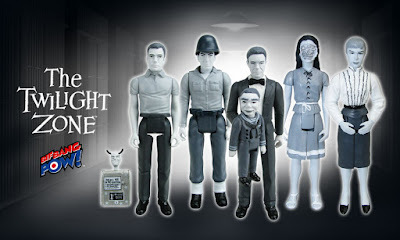 Wildly Popular The Twilight Zone Series 4 Action Figures Now in Black & White! 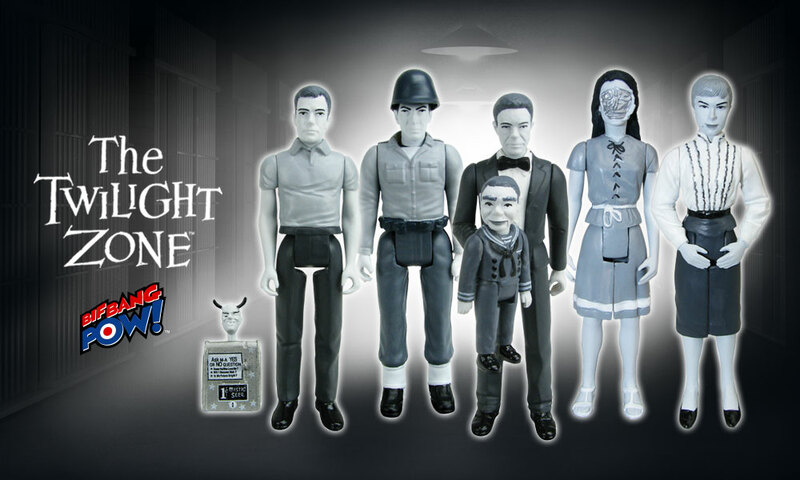 A fan-favorite at San Diego Comic-Con, The Twilight Zone 3 ¾-inch Action Figures Series 4 in Color captured the attention of collectors new and old at the show this year. And although we've sold out of the colored convention exclusives, you can still complement your collection with Don Carter, Hansen, Jerry and Willie, Alicia, and Marsha White “as seen on TV” in black and white – now available for pre-order at Entertainment Earth. 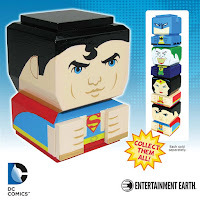 Designed similar to the action figures released in the '70s, each retro-styled figure features 5 points of articulation (neck, shoulders, and hips) and showcases a classic character with episode-specific accessories. 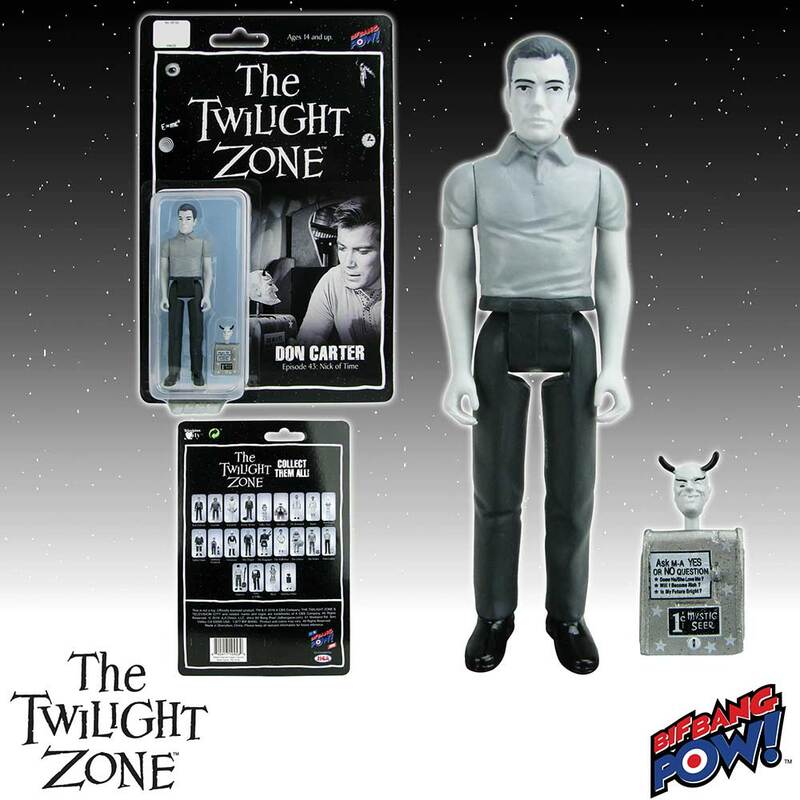 The Twilight Zone Don Carter 3 3/4-Inch Action Figure celebrates The Twilight Zone episode "Nick of Time" - featuring William Shatner as Don Carter. 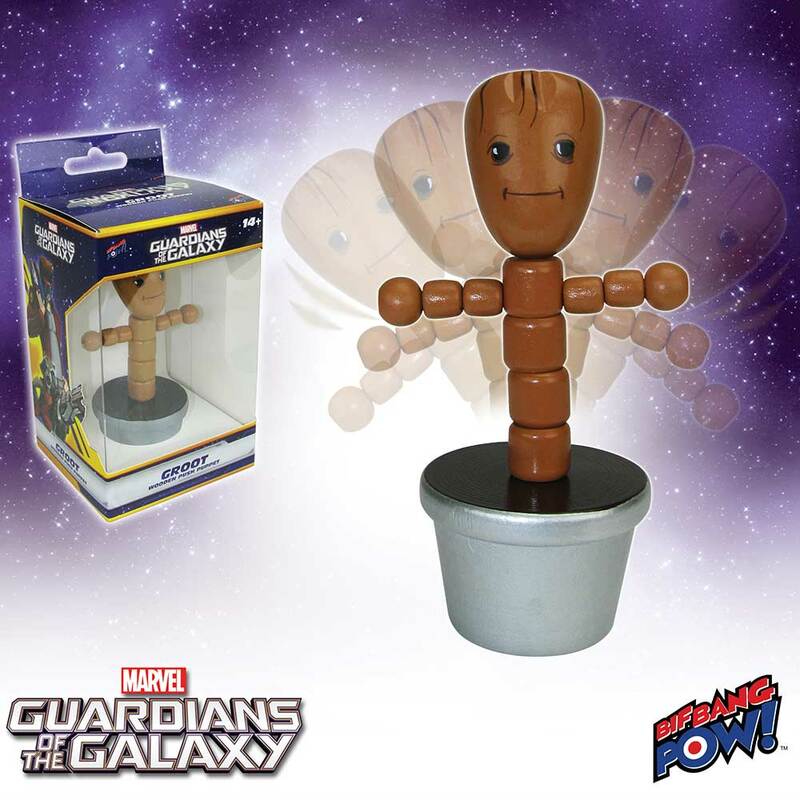 This unique figure comes complete with a miniature Mystic Seer inspired by the same fortune-telling machine shown inside the famous Busy Bee Cafe. 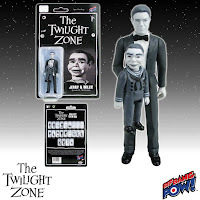 The Twilight Zone Jerry and Willie 3 3/4-Inch Action Figure pays homage to The Twilight Zone episode "The Dummy". 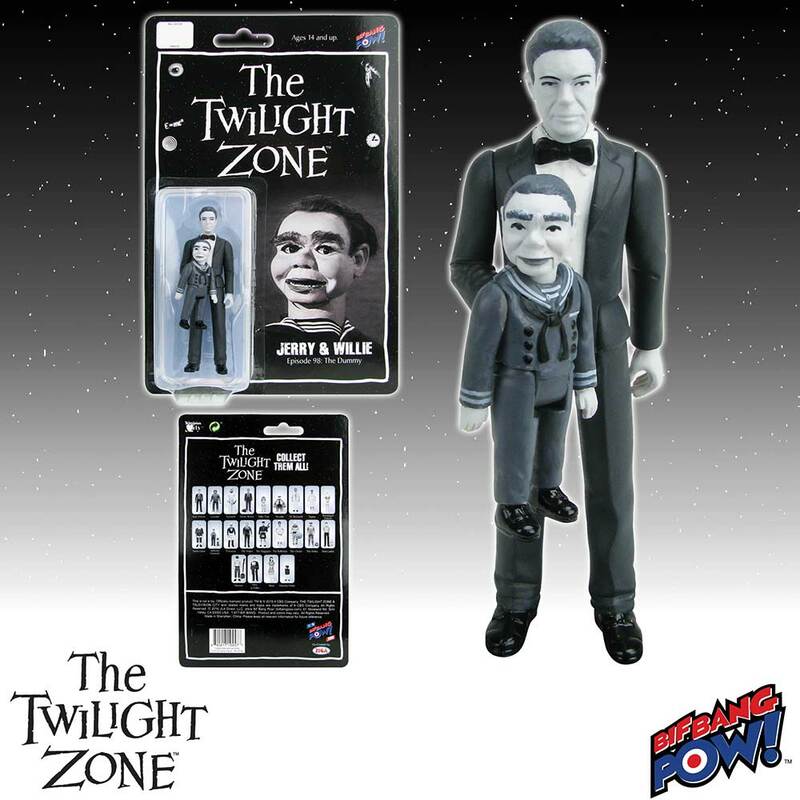 This rare figure of the persecuted ventriloquist appropriately comes with his deranged dummy - which also includes 5 points of articulation. But that's not all… Willie also features a hand slot in the back, so you can pose Jerry and Willie together! 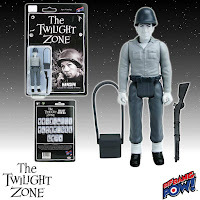 The Twilight Zone Hansen 3 3/4-Inch Action Figure salutes The Twilight Zone episode "A Quality of Mercy" - featuring Leonard Nimoy as Hansen, the radio operator. 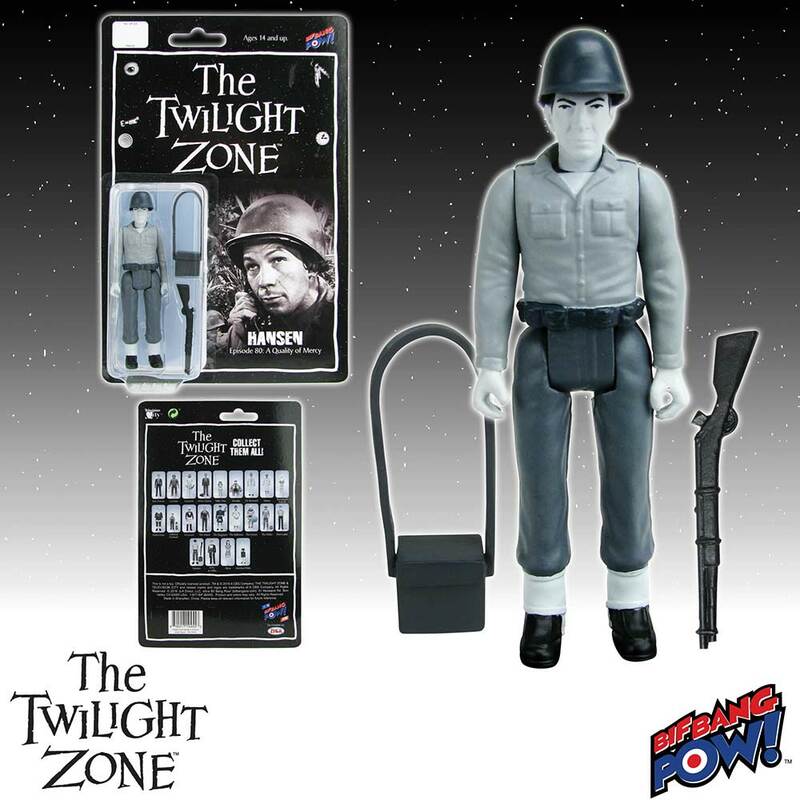 This exclusive show-inspired figure of the World War II character comes complete with his battlefield accessories: removable helmet, rifle, and field radio that opens to reveal a pull-out phone. The Twilight Zone Alicia 3 3/4-Inch Action Figure showcases the female robot companion in the heart-wrenching episode "The Lonely." This rare, limited figure showcases Alicia in her worst moment, after being shot leaving her mechanical facial wiring exposed. Is she just machine or something more? Only you can decide. 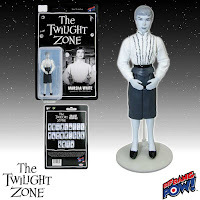 The Twilight Zone Marsha White 3 3/4-Inch Action Figure pays tribute to the well-known department store episode "The After Hours" starring Anne Francis. Complete with a stand accessory, you will have to look closely to see if this figure celebrates the female shopper, mannequin… or both! 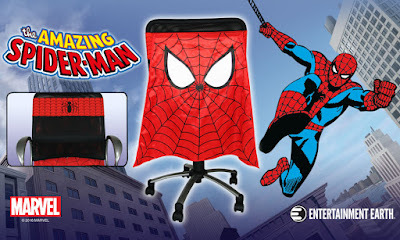 Want more show-inspired merchandise? 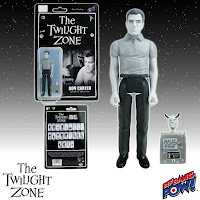 View all The Twilight Zone collectibles from Bif Bang Pow!.